Establishing the writing habit will pay you big dividends into the future. It doesn’t matter how many words you produce each day. What matters is that you DO it…. 1-Habits are relatively easy to maintain. Once you’ve established the habit of brushing your teeth before bedtime, for example, you don’t likely have to argue with yourself about the merits of doing it. You just do it. The same can be true of writing. 2-Habits require time, but they don’t demand willpower. As researcher Roy Baumeister has demonstrated, willpower wears out each day. You wake up with lots of it, but the willpower dribbles away as the day wears on, like sand running through an egg-timer. But if you’ve established a habit, you don’t need to exercise your willpower (and you can save that commodity for something else). 4-Habits can last a lifetime. Research by writer Charles Duhigg, author of the excellent book The Power of Habit, reveals that habits make up 40 percent of our waking hours. Don’t let mundane habits — like brushing your teeth or making your bed — reap all the glory. Instead, ensure that a few of your habits help you achieve your most important goals. So, the question remains, how do you set up a writing habit? I’m glad you asked! Start right now. It doesn’t matter whether it’s summer or fall. There’s no magic associated with the changing of the year. A habit is a habit. If you want to write, start today. Set a daily goal. This goal can be the amount of time you want to spend writing, or it can be the number of words you want to produce. Ignore those lists showing that Stephen King writes 2,000 words per day. In fact, if you’re just beginning, start small. Really small. I’ve worked with dozens of writers in my Get It Done program and some of them start with as little as five minutes. There is no shame in starting small. The only shame is in not starting. Identify your best writing time. There is no magic with being a morning lark or a night owl. Don’t believe the people who tell you to wake up at 5 am to write. (Unless you’re already a morning person. Then, and only then, it might be a good idea.) Instead, figure out what time will work for you. 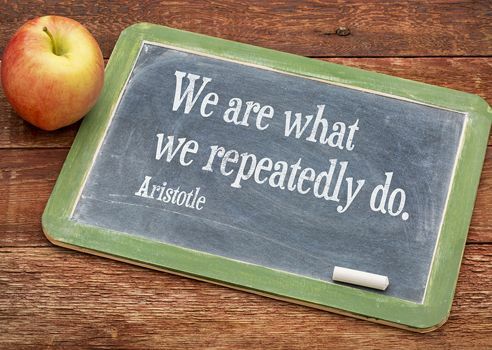 This habit is one you want to build for a lifetime. Make sure you’re happy with the timing and be certain you’re going to be able to continue doing it over the long haul. Write, even when you don’t feel like it. NEWS FLASH: There will be days when you don’t feel like writing. Ignore those feelings. Being able to put your unhappiness and doubt aside — while you continue to do the work — is what separates the professional from the dilettante. Understand that you are not committing to being a great writer every day. You are committing to writing. Give yourself some signs that you are writing. I write in 30-minute bursts, to the sound of a ticking clock. (I use the Pomodoro method.) I write in the same place and at the same computer. Further, I do my personal email and social media on my laptop, in a different room, so I am never tempted to fall into the pit of socializing while writing. You don’t have to follow my example, but develop your own symbols to yourself that you’re engaging in the writing habit. Reward yourself. Our society doesn’t offer nearly enough rewards. For this reason, you’ll need to honour yourself. You can do this with time (watching Netflix or browsing Facebook, perhaps) or with money (buying yourself a latte, an ice cream or a magazine) when you’ve maintained your habit. Start with making the reward daily and gradually tail off, so you reward yourself weekly or monthly. I imagine this project sounds rather mundane, as indeed most habits are. No matter. If you want to be a writer, you need the habit of writing. Doing it daily for a short amount of time is far more worthwhile than doing it irregularly. Or not doing it at all. My video podcast last week answered a reader question about the meaning of STET. Please consider subscribing to my YouTube channel. If you have a question about writing you’d like me to address, be sure to send it to me by email, daphne@www.publicationcoach.com Twitter or Skype and I’ll try to answer it in the podcast. Do you have your own writing habit? What do you do to make it work? We can all learn from each other so, please, share your thoughts with my readers and me in the “comments” section, below. And congratulations to Jim Homme, the winner of this month’s book prize, Business Writing and Communication by Kenneth W. Davis for a July 18/17 comment on my blog. Anyone who comments on today’s post (or any others) by Aug. 31/17 will be put into a draw for a copy of The Email Warrior, by Ann Gomez. To leave your comment, please, scroll down to the section, directly underneath the “related posts” links, below. Note that you don’t have to join the commenting software to post. See here to learn how to post as a guest.